Over-flowing pile of canned goods collected for food bank. There’s nothing like a party to make your living quarters feel tight. And we thought our two-bedroom home was way too spacious for us. Our neighbors, Dan’s economics colleagues and other Corvallis folks we’ve befriended made merry with us for several hours this evening. But with Oregon’s growing hunger crisis (third highest rate in the nation), all celebrations are tinged with sadness this time of year. 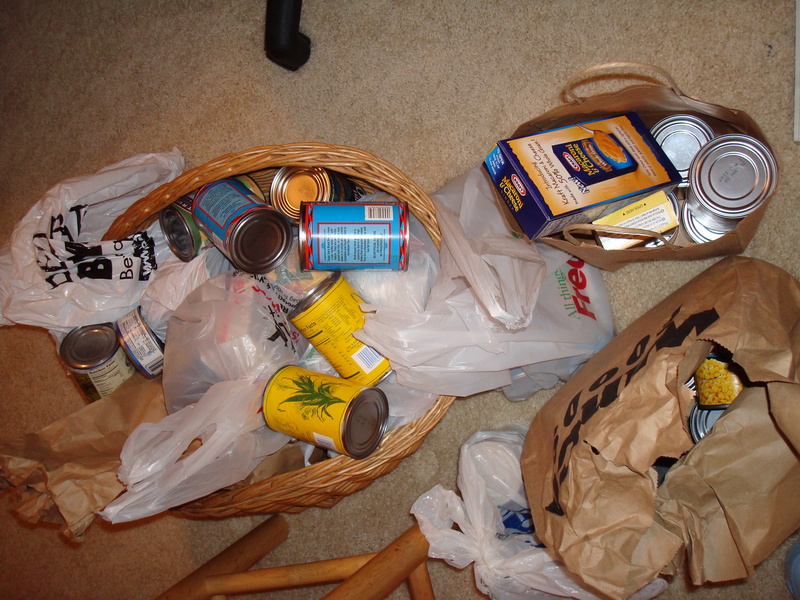 We asked folks to bring donations we will deliver to the Linn-Benton Food Share. It was a simple gesture people really seemed to respond to. Our guests also came bearing gifts of Oregon pinot noirs. We will enjoy those over Thanksgiving! We served those lamb meatballs I mentioned, chanterelle mushroom and delicata squash pizzas, pecan goat cheese balls, other cheeses and pickled grapes and prunes. Tangy, spicy brines really transform those fruits, which go nicely with a cheese plate. Read more about making the unusual pickles here. They were a cinch to make! 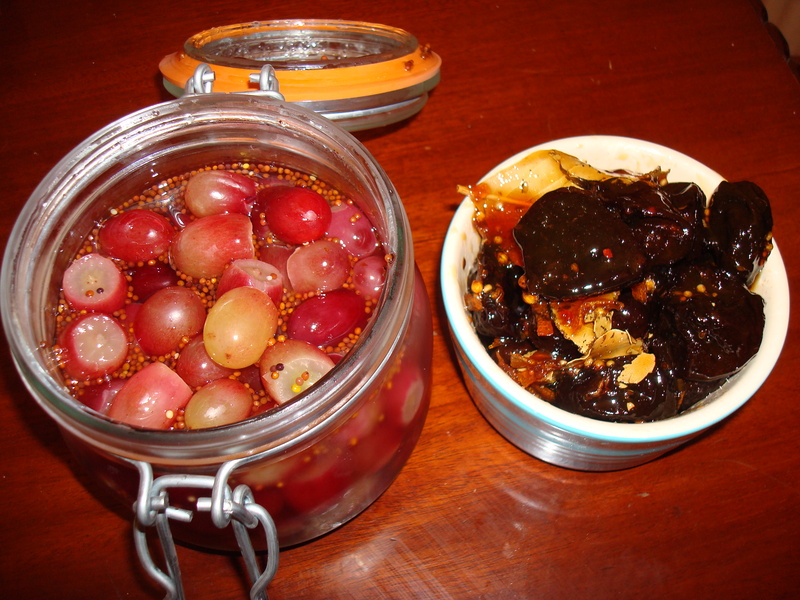 Your menu sounds fabulous…Pickled prunes? You’ll have to post more about your pickling techniques, something I’ve never tried but maybe you’ll tempt me. And I was happy to hear about your mindfulness of the season, too. We’re having a food drive at my school (goal is 1000 cans by mid-Dec, but we’ll surpass that for sure) and it’s been so neat to see some of our neediest kids bringing in bags of canned goods. I meant to post a link to the pickling recipes– I’ll do that now.